Most commercial fruit is picked before it is ripe. There is also a restricted range available at most retail outlets. Growing your own results in better flavour and you can plant your own preferred varieties. The size of garden will determine the type and vigour of tree(s) planted. If the garden is large then unrestricted trees can be planted. Smaller gardens will require types such as: bush (open ground), dwarf bush (container or open ground), espalier (fence or wall) , column (container or open ground), standards (open ground), half-standards (container or open ground), step-overs, cordons (fence, trellis or wires). Cordons are the hardest type to establish. The smaller the angle that the cordon makes with the ground, the greater the check on the vigour of the plant. They can be planted against a wall or along wire in open ground. If the latter, a north-south arrangement will give maximum sun exposure. Allow a minimum of 2.5ft apart if planting in rows. Make sure that the ground is well prepared and that there is no competition from other plants. If you are intending to plant step-over berry fruit such as loganberry or tayberry alongside a line of cordons, allow the cordons two or three years to establish before the berries go in. 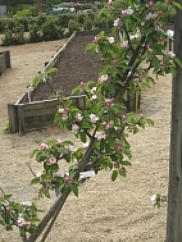 The apple pictured here is an Alfriston [Helmsley Walled Garden in 2010]. The main stem of the tree is cut at about 15" to 18" above ground level. The top bud is allowed to develop vertically and the side buds horizontally. All branches develop in the same plane. These are often used to cover walls. Use a more vigorous rootstock for a larger wall and plant the trees further apart, about 16' to 18'. 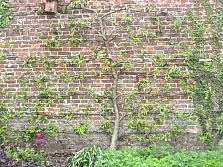 Less vigorous rootstock can be used for smaller walls with a planting distance of approximately 10'. Step-over (aka horizontal cordon) training. 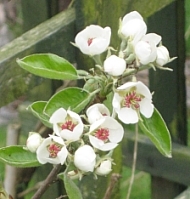 This apple is 'Anne Elizabeth', a cooker [Helmsley Walled Garden in 2010]. This method will not produce high yields but can be very useful as an edging feature but have a care for the visionally impaired. Most are either cooking or dessert, a few are both. Some varieties are biennial croppers. Can be purchased as bare-rooted or container-grown. (a) Bare-rooted: should be replanted when dormant (winter). Holes must be large enough for roots to be spread out and to depth of old soil mark. (b) Container: can be replanted anytime. Hole must have a margin of 4" below and around soil ball. Make sure that graft is above soil level. Soil (mixed with peat with some seaweed (or substitute) should be used to fill spaces. Make sure no air pockets are left. Shape shallow depression on surface around tree to collect water if planted in garden. Keep area around tree weed-free. Most will be grafted onto dwarfing stock which brings the tree into fruit more quickly and makes managing the tree easier. Make sure that the graft (junction) is solid. 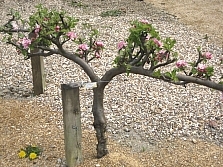 Fruit thinning may be necessary once trees are established. Canker: Discoloured elliptical spots on bark which sink into the wood, white fungus can also appear. Cut out diseased branches and burn. Scab: Fruit mis-shapen with brown/black scabs. Blotches on leaves. Leaves fall early. Burn all affected leaves in autumn. Prune scabby shoots. Codling moth: larvae tunnel into fruit. Use grease bands on trunk and biological controls. Numerous varieties available. Look for heritage or local varieties. Mid-season (Sept/Oct) or late season (Oct/Nov) fruiting variety probably suits this region. Generally the former will only store for a week after picking while the latter for about 2 months. Few are self-fertile. This shouldn't be a problem if there are other apple trees in your area. Otherwise you will need to plant more than one tree within the same pollination group. Crab apples can also act as pollen sources. Copes with most soils except alkaline ones. Bitter pit: skin pitted, brown spots in flesh and apple tastes bitter. Make sure tree doesn't dry out. Grenadier: very old tree, boughs heading earthwards supported by crutches. growing in a large tub. Smaller range of varieties than apples. Dessert pears need a lot of sun, foliage will blacken if exposed to cold easterly winds. Blossom is very sensitive to frost. Will cope with heavy soil but don't like sandy or chalky soils. Less able to deal with drought than apples. Slow to come into fruit (Pears are for heirs!) hence need for rootstocks and cordons etc..
Likely to need another pear for pollination since neighboring gardens are less likely to have pear trees. Bruise more easily than apples during harvesting. Pear blossom, Wem, April 2010. The true quince, a tree which usually reaches 12' in height and spread, should not to be confused with the Japanese Quince. Not usually recommended for the northern regions except trained as a fan on warm walls or in a sheltered spot. Flowers are large (2") and fruit resembles a squashed pear (about twice the size), often a golden colour and covered with white down. Usually crops in the 5th year. Fruit cannot be eaten uncooked but makes superb jellies or can be added to apple pies. Usually ripens end of October to beginning of November. Store in a cool and dark place for about a month before use. Don't store with other fruit - quince are very aromatic. Not an easy tree to prune but once 5-6 years old can be left (mainly) to its own devices. Try to keep the crown open but not empty. Fruit grows on the spurs. 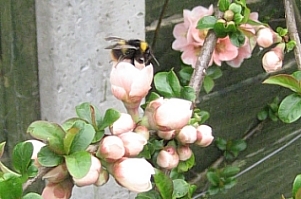 Japonica (Chaenomeles), often known as the false quince or the Japanese quince. It is a spiny bush, reaching around 6' in height and width. Can be trained against a wall or left as a bush. Branch development tends to be 'free-spirited'. Better to limit pruning to removal of damaged or diseased branches and let the plant get on with it. Copes with most soils but sensitive to drying out. Tolerates full shade, semi-shade or full sun. Flowers are attractive, colours vary though white, cream, pink and red. Some produce a sharp, aromatic, citrus-flavoured fruit. Resembles a small, flattened apple about 2"-3" in diameter. Cannot be eaten raw. Has a high pectin content and will also produce excellent jellies. Take care when selecting, some varieties do not produce fruit.